How Will Apple Cope with Decreasing Demand as Robots Put People Out of Work? Apple's business model is based on the idea that ever more people will be interested in ever more new products in the future. But as the middle class disappears and robots slowly displace workers, who will be left to fuel Apple's growth? An astounding video caught my attention this week. 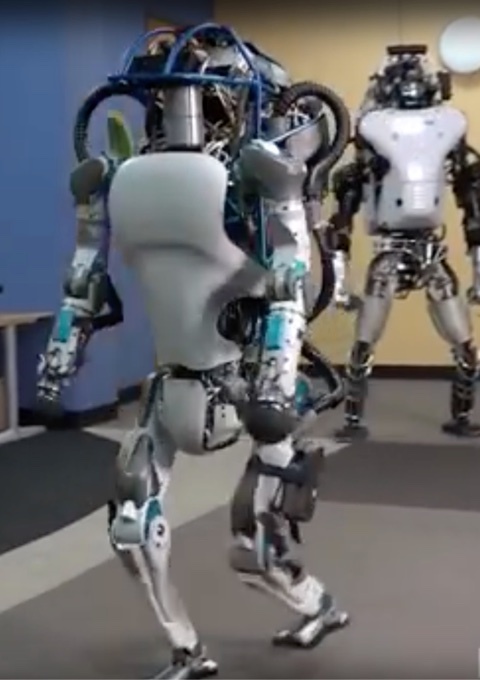 It's a promo video of the "Atlas" robot. TMO published a Cool Stuff Found article. For quick reference, here's the YouTube video. All of a sudden, all my science fiction reading kicked into play, and I started thinking about how robots like Atlas (and their undoubtably superior successors) will start to put certain kinds of professions out of work. Here's a short list of organizations that will be standing in line to acquire the future, commercial versions of this Cylon-like robot. I didn't try to be exhaustive. Here's a (short) list of professions that, in my opinion, won't be supplanted very soon by this kind of robot because they depend on the human-to-human element or skills not yet mature in early descendants of Atlas. In other words, this Google robot is "the end of manual labor." This demonstration should be a wakeup call to all young people thinking about their future. If you thought your career would be driving a truck, those trucks are going to be autonomous soon. If you thought you could work in construction, those manual labor jobs will be gone. If you wanted to be a fireman, those dangerous jobs will be handed over to the future generations of Atlas. It's clear that the jobs of the future will require the exercise of those mental skills that are the hardest to duplicate by a machine. That will require a very high level of education in professions like those I listed above. What we typically think of now as the human workforce will start to shrink. That will be bad news for some companies that depend on a growing base of well-paid customers to purchase consumer electronics. Will Apple be one of them? It's too soon to tell. Apple is a nimble company. But it's something to ponder. Next: The Tech News Debris for the Week of February 22nd. While we're on the subject of robots, I found a fascination article at Fast Company. "Microsoft's Radical Bet On A New Type Of Design Thinking." It's long, but its worth a your time. Here is a tantalizing quote to whet your appetite. And then [Microsoft's Kat] Holmes saw the movie Her, a visionary sci-fi film in which a love-lorn everyman played by Joaquin Phoenix falls in love with a digital assistant voiced by Scarlett Johansson. Holmes wangled her way into a connection with the movie’s production designer, K.K. Barrett, and asked him how he’d come up with such a credible-looking vision of the future—one which, in fact, she’d been working on even as the movie was being shot. Barrett answered with a curveball: He said that to make the technology look futuristic, he’d taken everything out that was technology. His approach was to simply let the director Spike Jonze focus only on what was human. All at once, Holmes saw it: She figured that in trying to understand how computers should interact with humans, the best guide was how humans interacted with humans. By the way, I've seen the movie Her , and it is excellent. The 4KTV technology is, as expected, being rolled out in increments. Nowadays, convention 4KTVs (without HDR) of substantial size are very affordable, about US$1,000. The next wave is UHD Blu-ray players, and Samsung's is now shipping. Once UHD Blu-ray players become pervasive, there's a market for content. And then the retailers start to see the synergy. See: "Best Buy Rolls Out 4K UHD Blu-ray Movies, Player Early." Pick a photo on the Internet. Not a photo of the Grand Canyon or the White House. Instead, pick a photo in Instagram of a kid in his back yard playing catch. What is the location of the photo? Nevertheless, humans are surprisingly good at this task. To help, they bring to bear all kinds of knowledge about the world such as the type and language of signs on display, the types of vegetation, architectural styles, the direction of traffic, and so on. Humans spend a lifetime picking up these kinds of geolocation cues. So it’s easy to think that machines would struggle with this task. And indeed, they have. Today, that changes thanks to the work of Tobias Weyand, a computer vision specialist at Google, and a couple of pals. This should scare the crap out of you. Finally, I think most of us Apple observers certainly expected Apple's next 9.7-inch iPad to be the "iPad Air 3." And it would support the Apple pencil. However, Apple appears to be thinking different. 9to5Mac sources report that the next generation iPad will indeed have an A9X processor and support the Apple Pencil, but it will be called something like the "9.7-inch iPad Pro." Upon reflection, this makes perfect sense and is brilliant. It tells me that Apple's plan to boost iPad sales, based on the current iPad Pro's technical and professional appeal, is working. And so it's logical to present the notion that this new iPad inherits the features and power of the larger iPad Pro. It's clever, synergistic product development and marketing.